LEGION is a dramatic thriller about a small rag-tag team at an isolated diner facing off the apocalypse; except this time, they are fighting God himself, with shotguns no less. 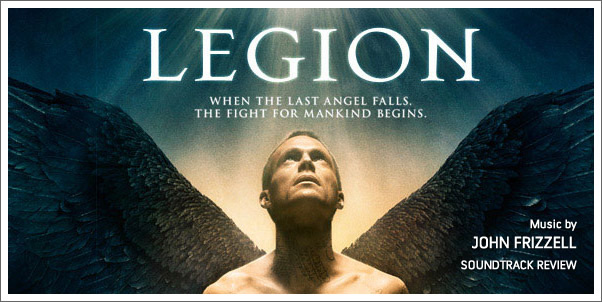 God has sent a legion of angels (who are armed to the teeth but prefer to possess people) to exterminate mankind (as in Flood, The Sequel), and the only supernatural being with any faith left in us is that rebel archangel Michael. Together they protect the diner’s pregnant waitress, whose child is believed to be the Earth’s only salvation from the wrath of God. By most accounts, the film fails to deliver on what could have been a great action, thriller, and/or horror fest and languishes instead in extended character monologues that couldn’t engage audiences. But maybe the narrative angle worked on composer JOHN FRIZZELL. Surprisingly, FRIZZELL, who is best known for suspense or horror (think WHITEOUT or THE REAPING), shone in the dramatic cues. The main story theme, initially heard in “Old and Pissed Off “ (4), perked my ears for the first time on this album. It is reprised more eloquently in ”I Didn’t Even Want This Baby” (17) and beautifully developed in one of the best cues on the album, “Die Like One of Them” (22).